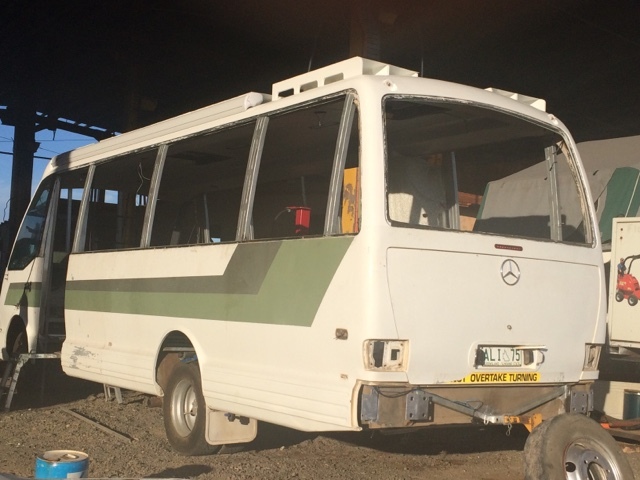 The Belgian and The Aussie: DIY motorhome: from the top down! DIY motorhome: from the top down! After we'd removed the seats, the old floor, and the windows (they couldn't be opened plus we wanted something that was more like an apartment on wheels rather than a bus that was lived in), H said that we needed to start working from the top down. First we put scaffolding right around the bus, on all four sides. This was greatly assisted by having already removed the bus windows. Then we used the part above the front windscreen as a mould and built a fibreglass 'spoiler' for the top front of the bus. 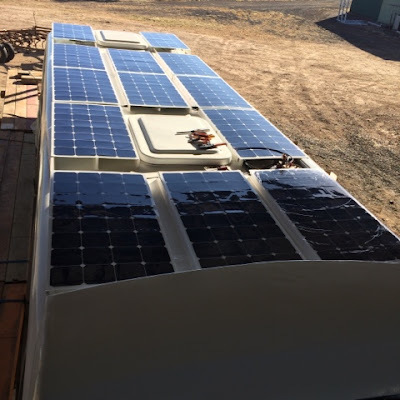 This was built to protect the solar panels and the massive 4.5metre awning that we were to install on the top of the bus. H has done bit of fibreglassing over the years and it's surprising simple. If you want to see how it's done I do recommend looking at a few YouTube videos. Next came the installation of the solar panels. We installed as many of them as we could fit, which meant 13 of them. We built brackets under them, which means that they also shade the roof. We used flexible solar panels, as they are a lot lighter and every bit counts! Behind the spoiler and under the left side solar panels, we've integrated the awning into the design: so it doesn't stick out. And that pretty much sum's up what we did on top of Blu. 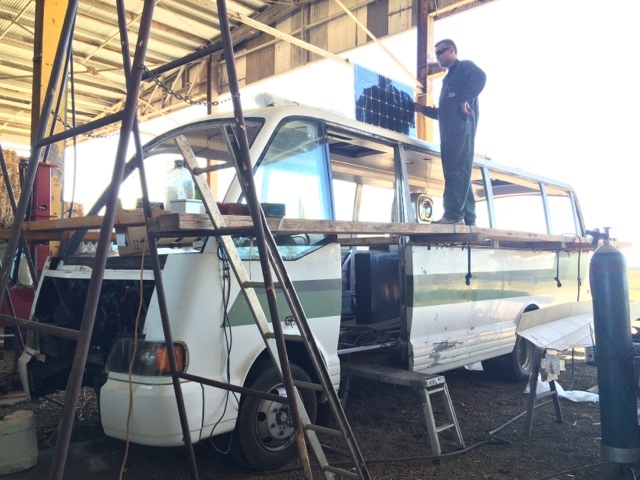 With scaffolding all around the bus it was much easier to do the roof work, and safer too! The newly installed solar panels: don't mind the crinkly plastic on them, it's just the protective layer that we could later remove. From the ground left side you can see the framing for some of the solar panels and the awning.